New Rochelle, NY, December 5, 2018–An examination of data from a multi-center case-control study of ovarian cancer in African American women found that women who reported higher levels of religiosity/spirituality had increased odds of stage III-IV ovarian cancer at diagnosis. Agreement with cultural/folk belief statements related to cancer was not associated with cancer stage at diagnosis. The full study findings are described in an article published in Journal of Women’s Health, a peer-reviewed publication from Mary Ann Liebert, Inc., publishers. Click here to read the full-text article free on the Journal of Women’s Health website until January 5, 2019. 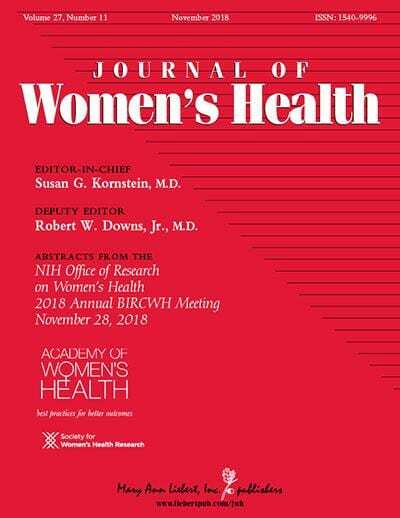 In the article, entitled “Effect of Cultural, Folk, and Religious Beliefs and Practices on Delays in Diagnosis in Ovarian Cancer in African American Women,” the researchers examined whether specific cultural/folk beliefs, religious practices, and perceived spirituality were associated with delays in diagnosis of ovarian cancer as indicated by later cancer stage at diagnosis or longer symptom duration before diagnosis. Cultural/folk beliefs and religiosity/spirituality were not associated consistently with symptom duration before diagnosis.